Even Donald Trump had given up on his friend Tom Brady before the end of the third quarter. Shortly after Tevin Coleman completed the Atlanta Falcons’ fourth touchdown of the night, to leave the New England Patriots trailing 28-3, the President got up from the table at his swanky Super Bowl golf club party in Florida and left. So we do not know whether he missed the greatest comeback in the history of American sport, whether he listened on the radio, flicked on the set back at his home in Mar-a-Lago just in time, or if an aide appeared at his door, breathless with the news. It was on. It was happening. A shock even greater than Trump’s landslide election win, a turnaround so incredible, it has no precedent in the NFL. 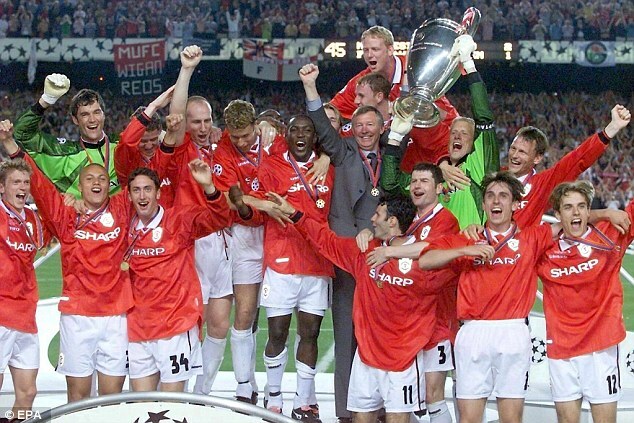 There is no equivalent of Istanbul, of Nou Camp in 1999 at the Super Bowl. The biggest deficit a winning team have ever chased is 10 points: amounting to one converted touchdown and a field goal. With less than 22 minutes remaining, the Patriots trailed by 25 points. They were, in Super Bowl terms, dead. The NFL’s big beasts had become its lame ducks. They were being outplayed by the Falcons, their icons reduced before our eyes. 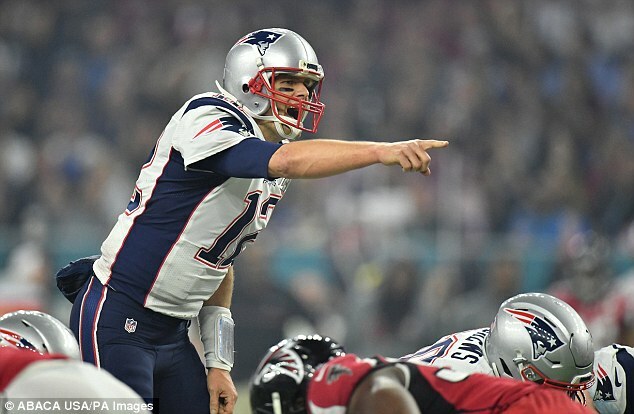 Brady’s radar was hopelessly awry, he was being read and caught time and again by Atlanta’s defence: Grady Jarrett, Deion Jones, Robert Alford. The Falcons ran up an 18-point lead in the second quarter alone, one touchdown a 77-yard interception by Alford to give Atlanta a 20-0 advantage. The game was over, before a fat lady — or even Lady Gaga — had sung. 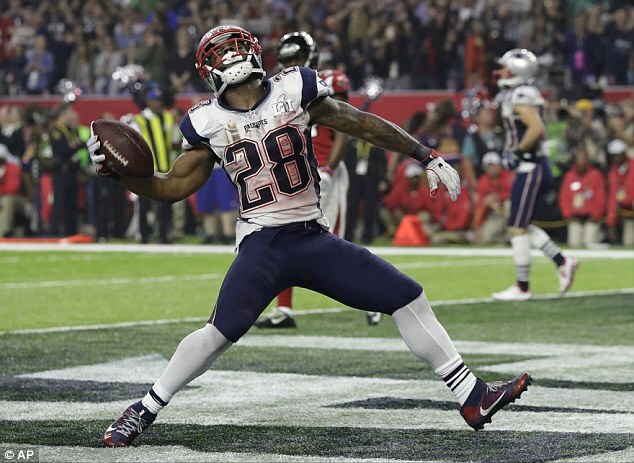 The Patriots had not trailed by 25 all season, and never in a Super Bowl. Even at half-time, with the lead only 18 points, the NFL’s outcome predictor gave the Falcons a 96.9 per cent chance of victory. Meanwhile, Brady’s obituary was being written. He had talked of playing until he was 45, in six years’ time. 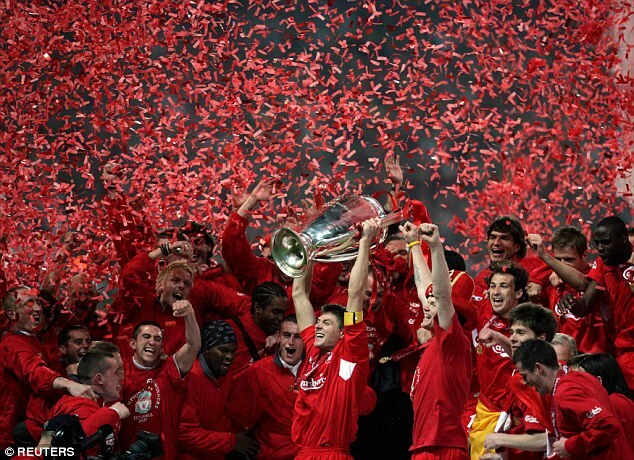 He had responded to a question about retiring with a defiant ‘Hell, no’ before the game. But he was being made to look all of his 39 years and 186 days by the best offensive team in the country. This was becoming a professional humiliation. It is in these moments, however, that we see true sporting greatness. Just as Steven Gerrard did for Liverpool in 2005, Brady flicked a switch. It was as if he decided that this would not be his epitaph, his last hurrah, his farewell. He would not let his critics, those who taunted and derogated him over the Deflategate scandal for which he was banned at the start of the season, have the last word. His final years would not be defined by controversy and this blasted match. 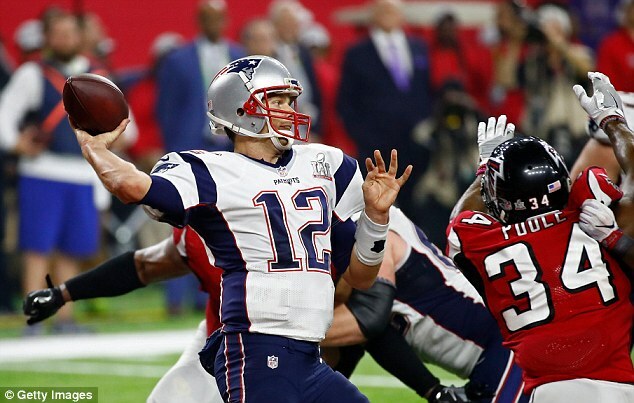 In what resembled a film script more than a sporting contest, Brady turned the game around. 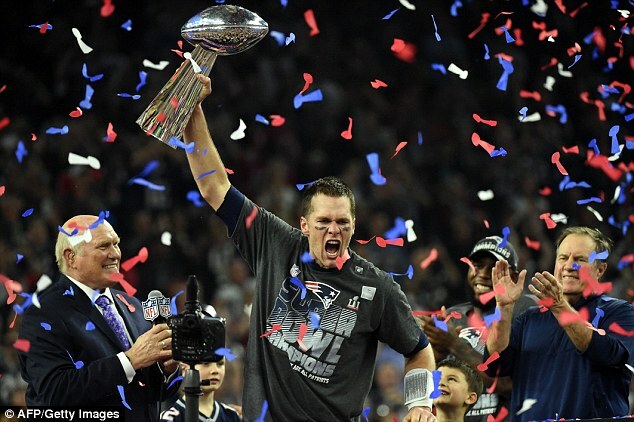 He took the Super Bowl into the first overtime of its 51-year history, won it there after three minutes and 52 seconds. He made an eight-point, 91-yard drive to tie the game and a 75-yard overtime drive to win it. He threw so sweetly, so accurately, so intuitively, it made those present doubt what they had seen before. Could this be the same player? It could. It was. America has not seen anything like it, and may not again. ‘At 28-3, they never looked back,’ said Patriots coach Bill Belichick and, crazily, that is true. Nobody seems to have informed Brady and his team-mates that victory was unthinkable. Much as nobody told Brady in 2000 that a sixth-round draft pick — two of those chosen ahead of him by Belichick back then never went on to play a single NFL game — was unlikely to go on to be the greatest quarterback in history. If that sounds too emotional, here are some facts. What Brady accomplished to turn this game around rewrote the record books. He inspired the greatest fourth-quarter comeback in NFL post-season history, and the biggest comeback in the history of the Patriots franchise. His 43 completed passes from 62 attempts are a Super Bowl record, as are the 466 yards he passed in total. Even his 416 yards in regulation time would have been a record, without the additional four minutes. It may be a team game, but it was a personal tour de force. The quarterback is everything in the NFL, more than a centre forward, a fly-half or a strike bowler. If his game is off, the team cannot function. Brady was off, and then he was on. And when he is on, there is no player quite like him. At last, he had the measure of the Falcons defence. He found his range, kept his cool, picked out his targets with precision, but also invention. It was one of the most remarkable displays in sporting history and to say the Falcons simply choked does it a disservice. Yes, they missed some opportunities. 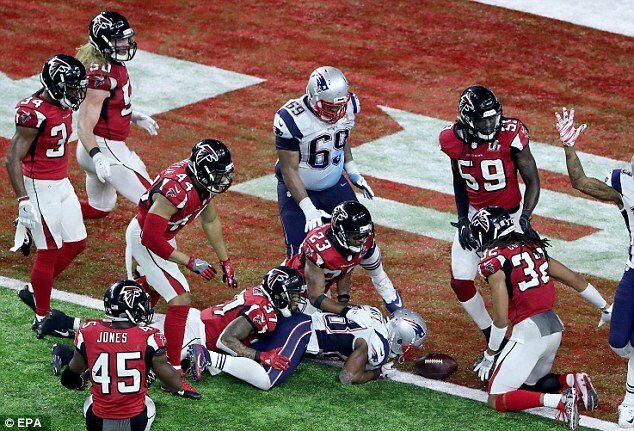 Yes, the sacking of quarterback Matt Ryan by the aptly named Dont’a Hightower was also a turning point. Yet the Falcons’ fate must be balanced against Brady’s own brilliance. He was relentless, even rising above the frustration when, after White landed the Patriots’ first touchdown to make the score 28-9, specialist Stephen Gostkowski became the only kicker to miss at a Super Bowl in 27 years. 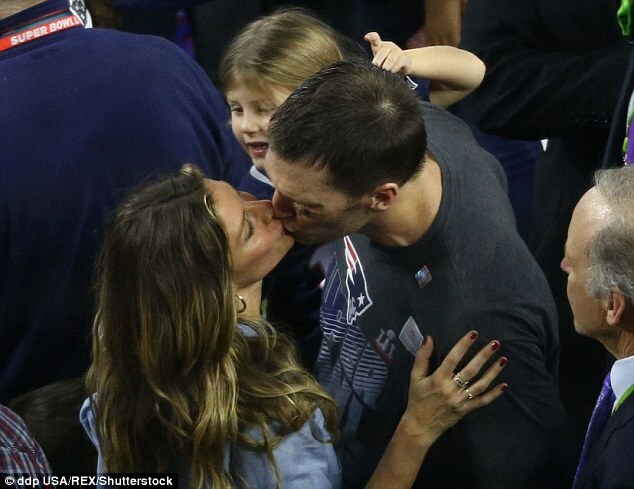 Without a flicker of emotion, Brady ploughed on. With 10 minutes remaining, Gostkowski redeemed himself with a field goal to make the score 28-12. From the turnover by Hightower, Amendola recorded the Patriots’ second touchdown. Brady couldn’t opt for the kick, which would’ve been worth only one point, and snapped the ball to White, who ran it in for two. There were now eight points — a touchdown plus another two-point conversion — between the teams. Brady worked his way up the field with almost divine guidance. 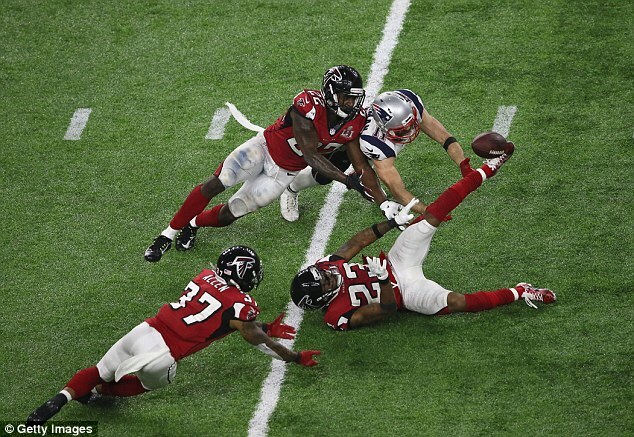 Picking out the magnificent Julian Edelman, the Patriots made the play of the night: a second-take catch under incredible pressure, the wide receiver appearing with the ball from underneath a hillock of bodies to widespread disbelief. Now they were near. Really near. The Falcons were feeling the hot breath of Brady’s destiny. 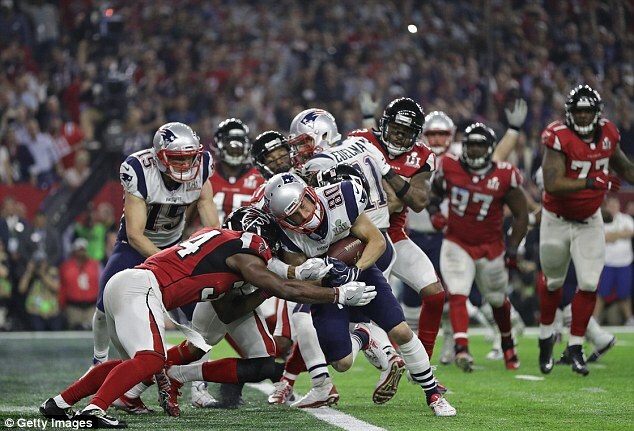 He found Amendola, another 20 yards gained: and then the two-minute warning sounded. How long that brief interval must have seemed in the minds of the Falcons. Brady, by contrast, looked serene. He locked in on White again: 13 yards, then seven. A penalty for defensive offside left the Patriots a yard from the end zone. To the right, White got over. Brady slipped the ball to Amendola to run in another two. Scores level, New England celebrated as if the prize was won. Perhaps, in that moment, they knew it was. Less than four minutes later, the Patriots were Super Bowl champions. Brady was the driving force again: finding White, then Amendola, Chris Hogan, White again, Edelman, White. He thought he had it won seconds earlier, but Atlanta’s Vic Beasley forlornly resisted the inevitable. Next time Brady made no mistake, picking out White to his right. Delirium engulfed Houston’s NRG Stadium, except around Brady. He stood still, then dropped to his knees, almost in prayer. His mother, Galynn, is seriously ill and was attending her first match this season, a bandana around her head. One can only imagine the personal pressure he would have felt to deliver in such circumstances. ‘Make room for the GOAT,’ was the cry when Brady entered the Patriots locker room after the end. ‘No, no, no,’ Brady insisted, but there is no debate about the Greatest of All Time now. Not just the greatest quarterback either. Brady would be the popular choice as the greatest footballer, in any position. And he will drive on, because five Super Bowls does not satisfy. Magic Johnson won five NBA titles; Derek Jeter was a five-time World Series winner. Six would put Brady on a par with Michael Jordan’s NBA haul. Seven would mean he stands alone among the greats in American sport; and this is surely the aim. It was 17 years ago that the Patriots owner first came across the man who would one day inspire the greatest comeback in American sport and the greatest of all Super Bowls.